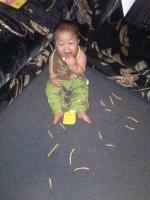 Baby Sign Language Blog - Infant and Toddler Signing Updates! Infant and Toddler Signs Updates! Our Babies and Sign Language site is constantly being updated with new pages of highly useful information and great tips just for you and your little baby signer! Anytime a new page is created, or our free baby sign language dictionary has been updated - it will be posted here on this page. Just check here and you'll be sure to find it easily! Keep up with our new updates simply! Please also remember that it's simple to join our RSS updates! Continue reading "Signing with Adopted Children"
Want to become a baby sign language teacher but not sure where to start? I'll show you the ropes. Register here! Continue reading "Workshop for Baby Sign Language Instructors"
This is for Members of the Baby Sign Language eCourse, members only. How to sign 'dirty diaper'. Continue reading "For MEMBERS ONLY | How to Sign Dirty Diaper"
Baby sign language set of 10 easy to follow posters for you and your baby. Get them and get started today! Continue reading "Baby Sign Language Poster Set for Babies, Toddlers, Parents, and Daycares"
Continue reading "Non-Verbal 2year old"
Deaf baby talk: toothbrush and "uh-oh"
Continue reading "Deaf baby talk: toothbrush and "uh-oh""
Teaching Baby Sign Language basics is easy using these custom-made baby signing charts and posters. These visual aids also help babies and toddlers with autism & other language challenges. Continue reading "Baby Sign Language Chart | Teach Your Baby to Sign | Teaching Baby Signing"
Baby sign language set of 10 easy to follow posters for you and your baby. Click here and check them out and grab..
Continue reading "Little Hands Express - Baby Sign Language Poster Set of 10"
Continue reading "For MEMBERS ONLY | Day 4 Poster Chart for Baby Sign Course"
Learn baby sign language with this free 5 day course. You'll be learning how to know when your baby is ready, when to teach..
Continue reading "Baby Sign Language - 5 Day Course Online - Learn Free"
Continue reading "Sign Language and Autism |Teaching Child Signing to Children Who Are Autistic"
Basic Baby Signing Course Day 4 | Which Signs Do I Begin Teaching Signing? The top three signs that you should start with are; more, milk and eat. (With the word 'finish' running a close fourth!) Eat looks like this..
Continue reading "Basic Baby Signing Course Day 4 | Which Signs Do I Begin Teaching Signing?" Baby Signing Basics Course Day 1 | What Is Baby Signing? | Pros or Cons? Continue reading "Baby Signing Basics Course Day 1 | What Is Baby Signing? | Pros or Cons?" Learn Baby Sign Language right now and understand your baby's wants and needs! 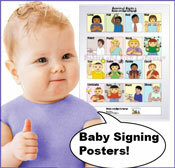 Grab a Baby Signing printable poster and start signing today! Continue reading "Baby Sign Language Printable Posters | Dictionary Charts"
Baby Sign Language – Getting Fathers/Dads involved too! Why does it seem that more mothers than fathers are learning sign language with their babies? Mothers tend to fall into traditional roles of parenting. Here's how to get Dad to sign with baby, too! Continue reading "Baby Sign Language – Getting Fathers/Dads involved too!" Baby Sign Language – How do I as a parent learn? Continue reading "Baby Sign Language – How do I as a parent learn?" 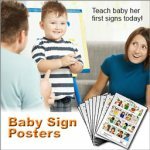 Continue reading "Earn Extra Income | Help Sell Baby Sign Language Posters"
The manual alphabet can help you understand sign language handshapes easier. Here are all 26 letters of the manual american sign language alphabet. 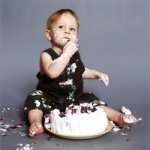 Continue reading "Baby Sign Language - American Sign Language Alphabet"
Continue reading "Mason signing "food""